Continental thai coconut lemon grass rice l bought when it first came out and it was okay but l expected better,a good brand but not for me. I eat a lot of this flavour and really enjoy it. I can’t eat gluten so find that sometimes having this on hand is all I can eat in the house and it has a delicious flavour that you don’t quickly get sick of. It fills you up and leaves you feeling full and warm inside. Very nice. 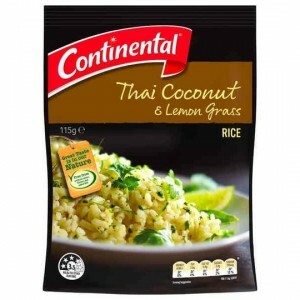 How would you rate Continental Side Dish Thai Coconut Lemon Grass Rice?